After the amazing Bloggers Hub #BHTWITTERPARTY I spent the whole of the evening searching through all of the amazing links that were sent to me. This was such an amazing twitter chat and I looked at new brands I'd never heard of before, found out so much about bloggers locally and got advice from other bloggers about a whole variety of things! If you were involved, I'm sure you would agree that there was this fantastic felt sense of support for one another. I'm definitely getting involved in the next twitter party with Bloggers Hub and am keen to check out any others! 2. 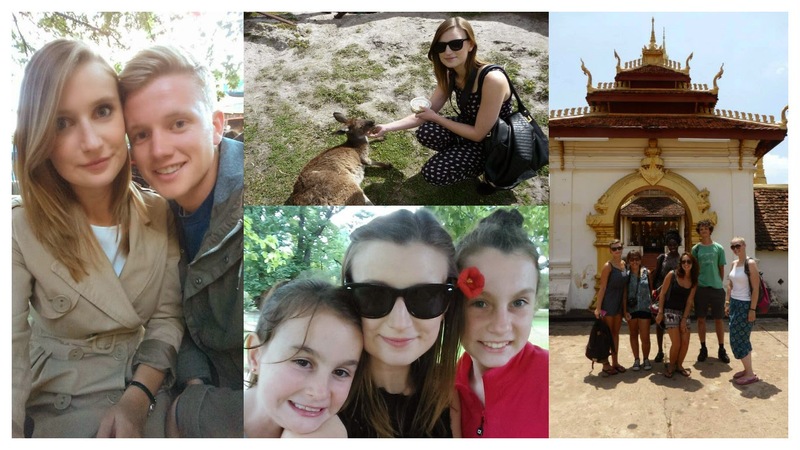 I became an au pair to the two loveliest girls you could meet. Whilst working in Australia for an Australian branding company, I also worked with a family to look after the two young girls and it was hands down one of the best experiences I have ever had. Of course we argued like sisters as they were only 9 and 11 at the time, but I walked away from my experience as an au pair with so many amazing memories of laughing, gossiping, shopping, beautifying...the list goes on. If you are feeling a little bit stuck in life and want to get away and explore another country, whilst having the security of a job then au pairing is definitely for you! I used Au Pair World to find my family, check it out HERE. 3. I went on a trip of a life time round Australia and South East Asia. Although I was on my own down the East Coast of Australia, I felt so at ease because I used an amazing company called Backpackers World. They help you pick all the hostels, trips, adventures you would like to do and put it into a big package so it is easy for you to follow as you travel through each town and city. Definitely recommend doing the East Coast if you get the chance, there are so many beautiful sights to see. For my trip to South East Asia I used STA Travel and G Adventures to book my group tour and again, although I was on my own, because I joined a group of like minded travel enthusiasts, I got to explore 4 beautiful countries in safety! 4. I got the job of my dreams. A few months ago after applying to quite a few jobs (about 250) I was accepted to work as a Marketing & Projects Executive in Cambridge. I know it sounds like a cheesy thing to say but I genuinely enjoy going to work as my projects are all so much fun. I never thought I would be lucky enough to enjoy my job so much at such a young age as I know a lot of people to struggle; but I feel so fortunate and definitely want to try and progress as much as possible within my company. 5. I celebrated three years with my man. Being in a relationship isn't always the easiest thing because everyone has their ups and downs; but I can easily say that through everything we have been through in life over the past three years, I am happy to have gone through it with him. We are both at such exciting times in our lives right now and I can't wait to see how things progress in the next three years. I am going to keep these short and sweet as I don't know what will come from this list, but hopefully good things! 1. I am working on an amazing project at work called Cambridge Style Week - imagine London Fashion Week, but on a much smaller scale and with lots of Cambridge retailers. Going to be a great opportunity to network, gain experience and also blog! I have been selected as one of the bloggers for CSW so will be blogging on here and on their site. 2. I will be blogging/vlogging a lot more. They are both my passion, but finding the time to do it is really difficult. When you work 9-5 monday to friday, all you want to do when you get home is slump somewhere in your pjs - but I have decided that I am not going to do that anymore and i'm going to get organised! 3. I will be moving out at some stage this year! Not sure exactly when as it is completely dependent on funds, but I think it is quite an exciting thing to look forward to as it will be my first proper non-uni style place to call my own. 4. I am going to attempt to get healthy. Now everyone seems to be talking about this at the moment and to be honest, I am struggling to even think about it, let alone actually do it! My motivation is that although people say 'you look fine', 'you don't need to lose weight', 'you look the same as always'...underneath it all, I don't look the same or fine and I would like to spend some time toning up. I need help, I will hold my hands up to that, but I am hoping that this goal will be successful for 2015! 5. I'm being proactive and getting myself invited to and involved in interesting projects. I need to get my name out there and network and make sure that people know what I am capable of! Being invited to PR events is amazing for so many reasons, mainly being...you get to meet people, you get exposed to new things and you get to relax in a situation where you are a guest and that is all! The combination of those three is just perfect for me and I can't wait to get myself out there! (Even if there are some knock downs on the way). Let me know your thoughts from 2014 and for 2015! I'd love to know.